May 23, 2015 -- BIT Magazine California Institute of Technology's (Caltech) latest prosthetic arm may be cumbersome, even uncomfortable for many to look at, but the work of this Caltech team and their colleagues from Keck Medicine of the University of Southern California (USC) is pioneering more effective direct interfaces between human neurology and machines. In their news announcement Controlling a Robotic Arm with a Patient's Intentions they describe a device controlled by a new section of the brain in which researchers have until now never attempted to interface with, the posterior parietal cortex (PPC), the part involved in our intentions to move our muscles and limbs, rather than the motor cortex where these motions are worked out. Previously, attempts to control robotic prosthetic limbs have used the motor cortex, but motions were difficult to perform and suffered from delays. By working in higher levels where movement is planned rather than where it is worked out, a smoother and less delayed motion results. 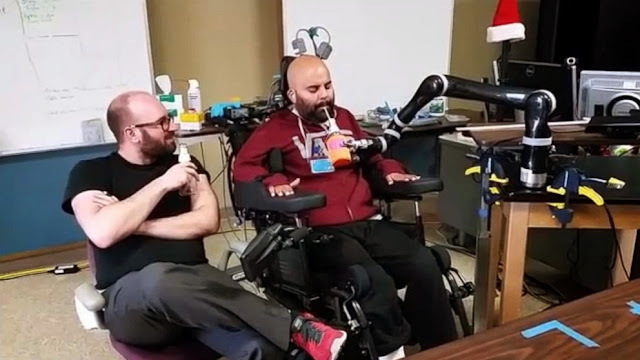 Among the pioneers of this experiment is the test patient himself, Erik Sorto, paralyzed from the neck down, and who underwent surgery to implant electrode arrays (96 electrodes each) in two parts of his PPC. After he recovered from his surgery, he was able to control both a cursor on screen and the robotic arm within the first day of trials. A video produced during the experiments shows him picking up a drink bottle with a nearby robotic arm, bringing it to his mouth, drinking from it, before placing it back on the table, simply by thinking about it. The impressive results indicate that the team's hypothesis that the PPC is a more effective point for interfacing between mind and machine than the motor cortex, was correct. The next step is taking these broader motions and combining them with finer motor control, but to do so, the sensation of touch is necessary. Researchers are investigating ways of not only improving signals sent from the brain to the prosthetic arm, but also providing sensory feedback to the brain, making the next generation of this system more like a natural limb. The lessons learned in the lab today will inevitably pave the road for the integration of mind and machine in the real world. 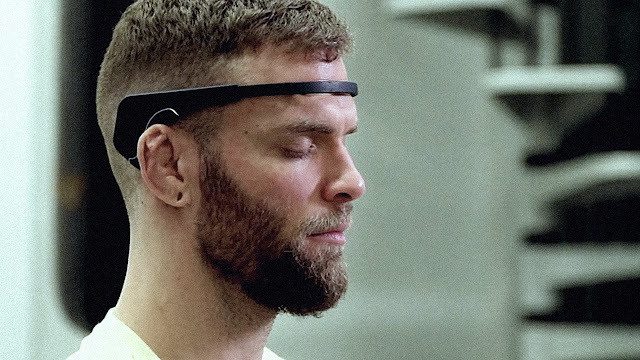 Already, there are consumer versions of electroencephalography (EEG) systems with either one or more electrodes that can translate brain activity into a signal sent to an application or even drones and robotic kits. More advanced systems like that developed by the University of Minnesota, can control a drone's altitude and direction. Best of all, these electrodes are non-invasive, meaning there is no surgery required. The possibilities for this technology are limitless, for both good and bad, and until now they have mostly resided in the realm of science fiction. However, this technology is already creeping out of the lab and into the hands of developers, including makerspaces around the world. The more people who understand it and can employ it means the more people there will be to watch for and protect against abuse. In terms of leveraging this technology for good, improved prosthetic hands are already an immediate application that comes to mind. Augmenting prosthetic hand projects like e-NABLE already unfolding in makerspaces around the world, with EEG technology would be a tremendous leap forward for the technology, for prosthetic devices, and for granting increased independence to people who have lost or were born without limbs. Beyond empowering the disabled, this technology could be used in a variety of ways to augment the daily activities of everyone. From remotely operating appliances, to summoning or sending off automated robotic platforms including rovers and drones, to personal devices that monitor our mental state and provide us usable feedback, all are now coming within reach. Like something off an old science fiction magazine cover, this man is wearing a consumer version of a EEG device. His brain's activity is being translated into a usable signal controlling an application. More advanced versions of EEG devices can control the flight of drones. The integration of mind and machine is approaching, and the more people involved and who understand the technology, its use and abuse, the more smoothly this integration will be, not to mention the more voluntary and non-invasive it will be. Leaving this technology in the hands of a few either out of fear or ignorance, almost ensures that it will be used by those determined to use it for the greatest good and the greatest bad, both entirely unchecked. For the former that may not be a problem, but enough science fiction has been written on the premise of the latter to be a cause of concern and impetus enough for us toward taking ownership of this technology. What ideas can you think of regarding mind-machine interfaces? What problems could it solve? How might people abuse it?